Once you understand what live rock is and its purpose in a saltwater aquarium, the next step in learning about live rock is how to cure it. However, before going into the details of this process here is our list of suggested guidelines to keep in mind when working with live rock. Be patient, take your time and don't rush it. Don't overload the system! Even top quality, fully cured live rock can be quickly turned into a dead base rock if mass quantities are introduced all at once. It is not a bad idea to add small amounts a little at a time and test, test, and test again. When the tank settles, wait a little longer and then move on to the next phase of adding a little more, repeating this process until you've obtained the total quantity of live rock desired. The standard suggested rule of thumb for how much live rock to use ranges from a minimum of 1 pound to a maximum of 1.75 pounds per gallon of water, but a visual method can also be used. The actual quantity you may need can vary depending on its density because geographically some live rock is denser than other types. For example, Indo-Pacific rock is said to be much lighter then Caribbean (Florida/Mexico) rock and pieces of coral rubble type rock collected outside the reef can be much lighter than inshore rock that has broken off in larger solid pieces. 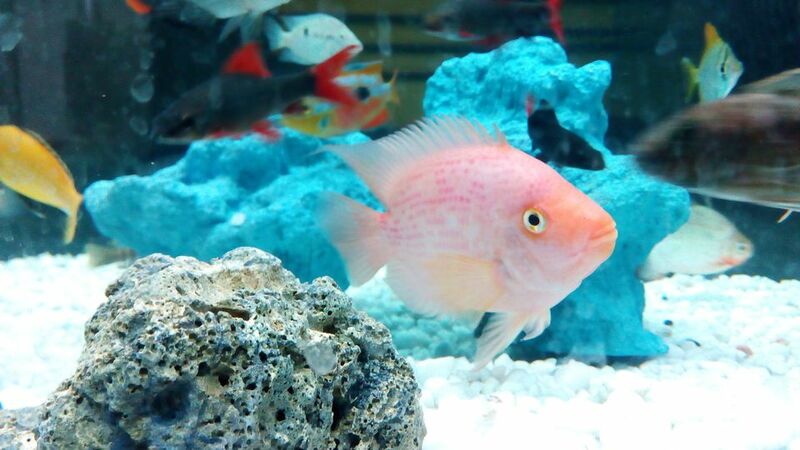 Before placing live rock into any aquarium or curing set up, whether the rock is cured or uncured, pre-cleaning and preparing it outside of the tank can greatly increase its quality and help to reduce the amount of die off. You can rinse it in a separate bucket or barrel of new saltwater, shaking it to remove organisms that may be embedded inside the porous rock, and remove any organisms that are dead or dying off (sponges, algae, soft coral or any growth that is turning black or has a white film on it) that can pollute the water. A pre-cleaning method suggested by experienced saltwater aquarists is to lay the rock out on a plastic sheet or tarp, spritzing it from time to time with a spray bottle filled with tank water the rock is to be placed into while cleaning it. After live rock has been added to an aquarium, keep an eye out for any white filmy or black areas on the rock and remove them. These are dead or dying organisms and can quickly pollute your water if not removed. Many aquarists choose to cycle a new tank with live rock, rather than live animals. This works well, but DON'T use fully cycled or full growth live rock to do so, or during the tank cycling process you will most likely end up with a dead live rock. You can begin a reef tank using a small, but adequate amount of seeded or cured base live rock as the center stones in the aquarium. Once the base rock is established and the tank is cycled, then you can begin to add, slowly, more advanced types of live rock like premium quality for back and sides (large flat shaped), encrusted octocoral (large long shaped, for high points), ricordia mushroom rock (for accents), and then you can start adding corals. How you arrange or aquascape the live rock is very important. Do not stack the rock solidly together. This will cause dead spots and lack of circulation that can lead to problems such as algae blooms. This also leaves fewer places for fish to hide. Remember that when you add live rock to an aquarium, the tank water level will rise. Only have the tank about half full of saltwater, and have reserve saltwater set aside to finish topping off the tank if needed once all the rock has been added. If you are going to take your aquarium in the direction of live rock and corals, adding a protein skimmer is suggested. Provide adequate lighting. Make sure all of your filtration and lighting equipment is in place and ready to run after you add the live rock. Once up and running, additives such as kalkwasser (calcium), iodine and strontium will encourage the growth of pink and purple coralline algae and contribute to the health of other forms of live rock growth as well. With these helpful Guidelines in mind you are very close to being ready to get started with live rock, but first, you need to know how to handle and cure it before doing so.